Klipsch and Capitol Records partner for new speaker range | What Hi-Fi? Two venerable American brands, both around since the 1940s, join forces for co-branded Heritage special editions. 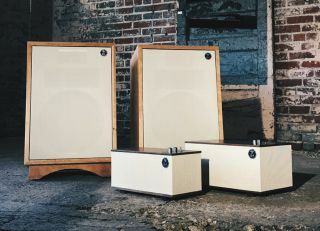 Klipsch (established in 1946) and Capitol Records (established in 1942) have announced a co-produced and co-branded Heritage and Heritage Wireless series of speakers. And there's a free Capitol Records vinyl record with each purchase. Making an understably big deal of the, well, heritage of Klipsch's Heritage range of loudspeakers, these new models feature real wood veneers and gun-metal switches and knobs. The looks are firmly in the 'mid-century modern' camp. The Capitol One is decribed as 'semi-portable', has an eight-hour battery life and Bluetooth connectivity as well as 3.5mm analogue input. It weighs a little less than 4kg, and features two 5.7cm full-range drivers and an 11.5cm woofer driven by 30 watts of amplification. The Capitol Three is a bigger, mains-powered speaker with aptX Bluetooth capability, 3.5mm analogue input and switchable line-level/phono-stage RCA inputs alongside a USB input capable of handling digital files up to 24bit/192kHz. The same full-range drivers found on the Capitol One are here augmented by a larger (13cm) woofer and a pair of 13cm passive radiators. The traditional stereo pair in the range are the three-way Heresy III. Inside each cabinet (hand-made in Arkansas) is a 12in woofer, horn-loaded titanium midrange and horn-loaded high-compression tweeter. All three speakers are available in either blonde wood (with tan grille) or ebony wood (with salt-and-pepper grille). We're awaiting confirmation of UK pricing and availability. For now, though, we know Amazon in the U.S. is asking $2600 for a pair of Heresy III, $500 for Capitol Three and $300 for Capitol One.